Description:CAZ 200 INPAK Injectable Packing is a carefully controlled blend of high-tech greases and lubricants combined with modern fibers resulting in a superior product. Its malleable consistency makes it easy to use. It can be injected with a high pressure gun or installed by hand. Unlike braided packing, no cutting is necessary. It will conform to any size stuffing box and seal it. CAZ can offer you three styles for different industry conditions. CAZ can offer you three styles for different industry conditions. CAZ INPAKTM unique properties assure superior performance and deliver major benefits resulting in improved plant and equipment maintenance at reduced costs. Its ability to fill any crevice makes it an effective seal on worn or grooved shaft sleeves. It requires no cooling or flush water. The operating costs of wasted water and product are eliminated. It will run leak free. Its low friction coefficient means equipment runs cooler, consumes less energy and last longer. 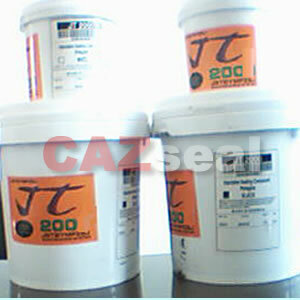 Highly versatile, CAZ INPAKTM is formulated in a variety of styles to meet the conditions found in almost any industry. Style 200 W&Y can meet FDA standards for food and potable water applications.